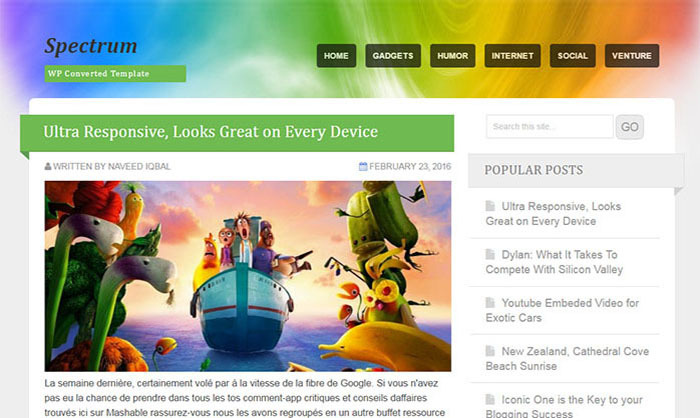 Spectrum Blogger Template having elegant rainbow style live colors.It was previously designed for WordPress blogs but now it’s coming in new and stylish look and one of the most interesting thing that it’s now available for blogspot blogs and comes in a stylish look. You can download and use this theme on your desired blogger blog. It has responsive, Simple, SEO friendly and super fast loading design. It’s one of the best and ideal theme for Blogging, Magazine, Personal, Social, Gadgets and Stories writing blogs.